As my mom is a home maker, we are blessed to get home cooked food daily. Soup is compulsory while I was growing up. Not every meal is an elaborate one of course. There will be days, simple and yet delicious are enough to satisfy a hubby and 4 growing kids. 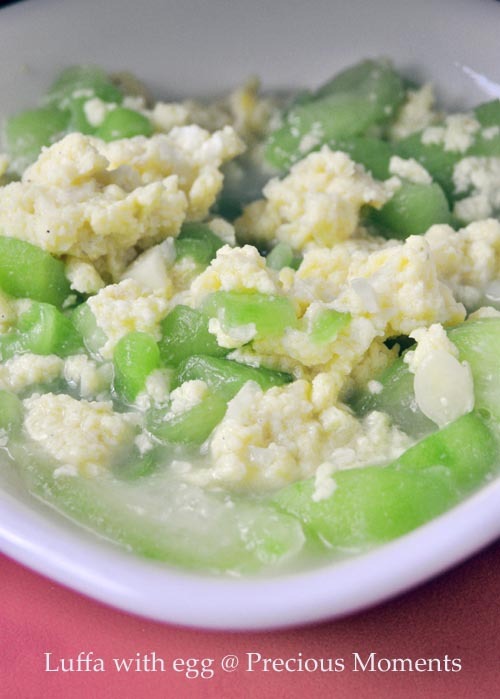 One such dish that I enjoy is Stir fry Luffa with eggs. I tried making this dish sometime back but I bought a bad one. It was dry. Thus when I saw some really fresh looking luffa available in the wet market, I just bought one home! I guess the colour of the luffa tells its freshnest! Felt so nice to be receiving a Liebster Blog award from Yummy Bakes. Especially when Liebster actually means favourite or dearest in German. Thanks Chris! Sure been a long time since I last seen award passing around. A nice gesture to keep fellow bloggers in mind and continue to motivate them further. - Copy and paste the award to your blog. - Reveal the 5 blogs you have chosen to award and let them know by commenting on their blog. - Hope they pass it forward by accepting and awarding it to bloggers they would like to honour. 1. Do What I Like - a blog that I first looked up to for cake baking. Her recipes never fail. 2. Bisous À Toi - a great blog as well as a great food stylist. 3. Kokken 69 - a flair in balancing simple and yet elegant styling. 4. Frozen Wings - for always coming up with new ideas and a great inspiration for me. 5. Cuisine Paradise. Making homecooked meal look simple and yet delicious. Of course there are more than 5 blogs that are my favourite! Don't be sad for you are not forgotten. thank you edith! thanks for passing the award to me and remembering me too. You're too kind with your words up there lah, i enjoy learning from you and getting to know you better thru your blog. Thanks again, much appreciated! Love luffa with eggs. Just cooked some a couple of days ago! Congratulations on your award. I have a couple of awards for you over at my blog, do stop by when you can! Thank you! I know you posted this a while ago, but I'm glad I didn't totally miss this post. I love this. This is a nostalgic dish for me too! I cant get luffa easily here, which is a shame because it actually looks liek it's quite simple to prepare (not to mention super super delicious)! Ah, making me miss home..
lena, it is nice to get to know you better too. kitchen flavours, thanks. Will hop over. Elpiniki, you have a great recipe blog. Shu Han, thanks for dropping by. Cook this yourself, it is super easy.